Aloe Vera Gardening in Spain. The Aloe is a succulent (Liliaciae Sub species aloinae), a member of the lily and onion family, also related to garlic and asparagus, of which there are more than three hundred varieties but of which only a few had medicinal properties. It is generally accepted that the most potent is Aloe Vera Barbadensis Miller. Back when I was in my 20’s I spent a year living in the Mexican city of Guanajuato. It was there, after a very unfortunate incident with a gas water heater and a naked flame, that I ended up in a hospital emergency room with the top layer of skin burnt off my face and neck. The doctor that treated me didn’t seem too concerned, he simply handed me one of the small spiky plants that were growing in pots around the department with instructions to smear the gel inside the leaves over my face for the next week. 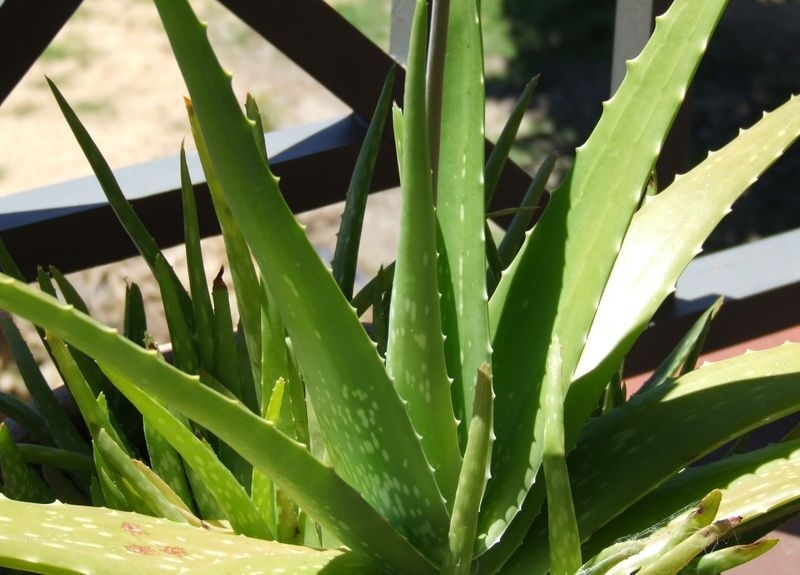 It worked, within five days my burnt skin was completely healed without a single scar and there began my love affair with the truly wondrous aloe vera plant. All of us heard how effective aloe vera gel is in the treatment of sunburn, in fact, most people think that is all it is good for. In reality though aloe vera is useful for both external and internal use and can indeed be considered a super food. All you need do is snap off a leaf, remove the skin to reveal the jelly like interior and chop it into water or fruit juice, whizz it into smoothies, mix it with yoghurt…….It’s not the tastiest thing in the world but the health benefits it offers make up for that. The aloe vera plant grows abundantly in this area of Spain. It is antibacterial, antiviral and antifungal, and is well known by herbalists. It’s common sense really, if aloe vera gel wasn’t antibacterial every little tear or scrape of the plant would result in the entire thing being eaten up by bacteria. Aloe needs to be antibacterial simply to survive in the wild or its moist, nutrient rich gel would provide a perfect breeding ground for invading bacteria. There are actually so many health benefits to using aloe vera gel that I can only go into a few of them in this article. Let’s start with the external, topical use of it on the skin. I personally think that we should all throw out our standard first aid kits with all those silly toxic antibacterial sprays, creams, lotions and bandages and simply replace them with aloe vera plants. I’ve been known to pack small chunks of aloe vera gel inside wounds that have healed in just a few days with zero scaring. As the aloe gel dries it contracts and draws the wound shut while attracting an increased flow of blood to the wound which accelerates healing. At the same time the aloe vera gel kills bacterial, prevents infection and also provides nourishment to the wound tissue. I use it regularly on my dogs and cats, if they lick the wound they’re not licking all those harmful toxic chemicals found in most first aid products and it’s so easy and cheap to re-apply. Why on earth would anyone consider smearing wounds and injuries with toxic antibacterial creams and sprays? Whenever I go hiking in the mountains I take a leaf of a plant with me. It treats cuts, scrapes, burns, bites, stings, punctures, sprains, sunburns and even bruises. And as an added bonus if you ever find yourself stranded and dying of thirst you can eat the gel for its water content. There are so many Health Benefits to using the gel…………. Another interesting use of aloe vera is in its effective treatment of gum disease. You can either rub the gel directly onto your gum line or take the gel mixed with water as a mouthwash. It’s fantastic for mouth ulcers too and don’t forget you can drink it as well. 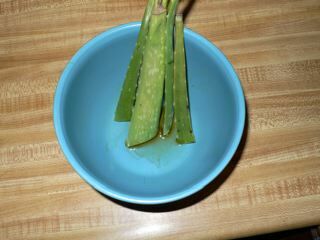 By doing so you’ll be bathing your gums in healing aloe gel and any bleeding, swollen or painful areas you have will begin to heal rapidly. Even severe cases of gum disease can be completely cured in a matter of weeks. So forget about all those chemically flavoured, blow your head off mouth washes. Bathe and nourish your gums and general oral area with aloe gel. You’ll not only benefit your gums and oral hygiene but you’ll be cutting down on your body’s general chemical load which is always a good thing! So, go on, invest in a couple of plants, they grow easily in this climate and you’ll have your own perfect little, portable first aid kit growing right at your fingertips. More to come on the super healing powers of aloe vera in future articles. Happy natural healing everyone! Aloe vera became so widely grown as a medicinal plant in ancient times that its exact region of origin is a mystery. This species is of considerable economic importance and extracts are included in all manner of pharmaceutical preparations for the skin, treatment of burns and for ingestion. It is important to use the correct species of Aloe for medicinal preparations, as some species e.g. Aloe venenosa are poisonous. Toxic reactions by sensitive individuals to Aloe barbadensis (Aloe vera) have been reported, despite its widespread, mainly safe use. This species has been so widely naturalised and grown as a medicinal plant that its exact region of origin is a mystery. However, it’s origin was probably within the Arabian peninsula. Aloe vera is probably the best known Aloe and is of considerable economic importance. Extracts of the gel from the center of the leaves are included in all manner of pharmaceutical preparations for the skin, treatment of burns and for ingestion. However, some people have allergic reactions to substances in the yellow sap under the epidermis. Most people use aloe simply by cutting off a piece of leaf and squeezing the liquid onto their skin. This works, but it wastes the inner gel, which is the most potent part of the plant. 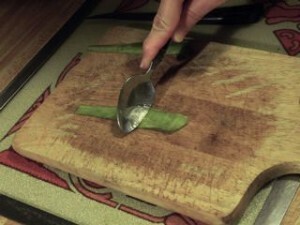 To use the gel, you’ll need to “fillet” the leaves rather than merely squeezing them. The filleting process also reaps much more aloe gel/juice. When properly prepared and refrigerated, this final product can last a year or more! First, a little terminology. Starting from the outside of the leaf and working inwards, we have the “rind”, the “sap”, the “mucilage” and lastly, the central core of “gel”, also known as the “gel fillet”. For home uses, the rind is only good for composting. The yellow sap (also called “aloin” or latex) should be avoided when possible. It’s used as an ingredient in laxatives, and can cause diarrhea and other problems if taken internally. The mucilage and gel are the most important parts of the plant for home medicinal use. Aloe should be processed within a couple of hours of harvest so as to prevent oxidation. Begin by selecting a large, healthy outer leaf that’s close to the ground. These are the oldest and most potent. 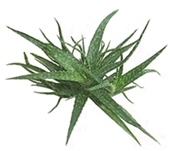 (If none of the leaves are close to the ground, the plant may be too immature to harvest.) Cut close to the base of the plant at a slight angle. Stand your leaf upright in a slightly tilted container for roughly 10 minutes. This allows much of the sap to drain out. You may not see the sap in smaller leaves. To make your task less messy, wear latex gloves like the professionals do. 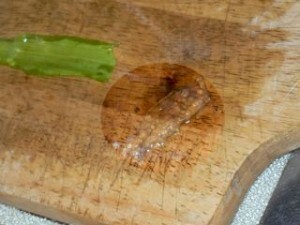 Lay the leaf down flat on a cutting board. Carefully use a sharp knife to cut off the leaf’s tip and its serrated edges all the way down both sides. Slice the inside of the leaf lengthwise so that the front and back can be separated. Use a spoon or (for larger leaves) a butter knife to scoop out the mucilage (the slimy stuff) and the gel (the clear, solid “fillet”). Press down firmly, but lightly. Too much force may scrape out sap, which you want to avoid. We advise against using your fresh aloe juice internally. It’s difficult to remove all of the sap, and this can have negative health consequences, particularly for pregnant women, seniors and young children. Aloe can be useful internally for specific ailments, but we recommend that you consult with a naturopathic physician before undertaking this treatment. If you’ve consulted with a naturopath and want to use your juice internally, process only the clear gel fillet. 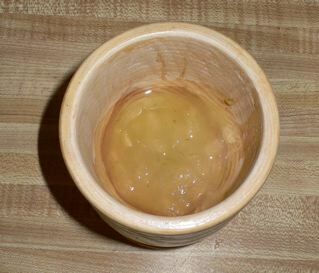 Rinse it in a mild vinegar solution (vinegar mixed with water) to remove more of the sap’s residue. Eat or drink the amount prescribed as soon as possible for maximum benefit. You may want to flavor it with something tart, salty or sweet (such as fruit juice). Save excess gel by freezing it. For external use, you can mix the gel and mucilage together to create your “juice”. The gel can be difficult to liquify. Some people puree it using the base of a blender and replacing the standard container with a mason jar This also works well for chopping spices and nuts. Aloe juice that hasn’t been commercially processed tends to have an unpleasant odor. This is normal and won’t affect its properties. Don’t forget to store your aloe juice in the refrigerator. Use a glass or food-safe plastic container. Brown or dark green glass is best to block out excess light. Even a small amount of aloe juice can go a long way. To make it last even longer and to prevent discoloration (your juice will eventually turn brown), add a drop of vitamin E and a drop of grapefruit seed extract, or mix in some citric acid powder. Remember, however, that aloe is best when fresh. There’s an ongoing debate between commercial aloe producers as to whether or not “whole leaf” processing yields a superior product to the traditional “fillet” method. Whole leaf processing usually involves grinding up the entire aloe leaf, removing the rind by pouring the ground leaf through filters, and then removing the aloin (sap) by running everything through a charcoal filter. Even among whole leaf processors, there’s a debate as to whether or not charcoal filters and most other latex sap removal techniques decrease the aloe’s positive affects. Home whole leaf processing is difficult, but if you’re a devotee of this method, it is possible. 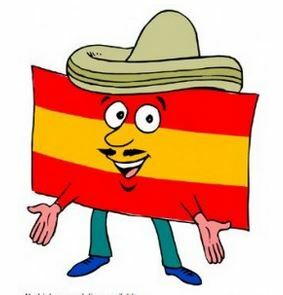 Thinking of a break in Spain then Click above for Discounted prices of Hotels Apartments, Guest Houses and Villas in Spain.